According to Genesis 10, Canaanite nations included: the Hittites, Jebusites, Amorites, Girgashites, Hivites, Arkites, Sinites, Arvadites, Zemarites and Hamathites. 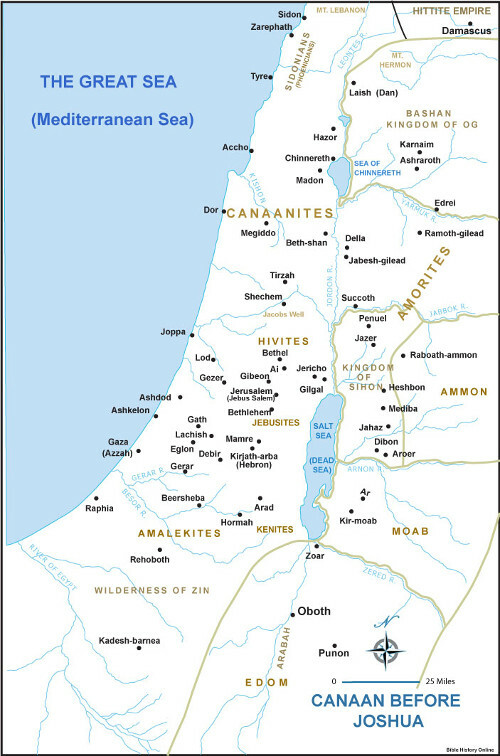 These people settled the region east of the Mediterranean Sea and west of the Jordan River that was known as Canaan. During his journey to Egypt, Abraham was promised the land of Canaan to his offspring - Genesis 12:1-7. After Moses freed the Israelites, he led them to the fringe of Canaan. Joshua fought the final battles to bring Jacob's descendants into the land foretold to Abraham. Modern day countries that reside in the region of Canaan include Israel & the West Bank.